The Large Outdoor Ashtray from Crown Verity is constructed of stainless steel with a removable weather tight galvanized holding compartment and an interior liner that restricts oxygen and prevents fire. 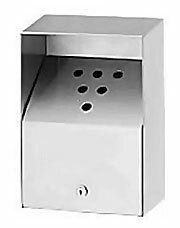 Provides a clean, attractive and effective way to keep cigarette waste concealed from public view. Durable construction for the needs of the busy commercial property. Perfect for building entrances and smoking areas.